The CS681 is the third generation of Primelec’s search coil systems for the linear detection of 3D eye and head movements. The system’s ultra high accuracy and bandwidth guarantees effortless recording of not only saccades, vergence, smooth pursuit, vestibular and optokinetic eye movements but also of miniature eye movements: drift, tremor and microsaccades. Applications include neurophysiological, ophthalmological, psychological, psychiatric and visual studies. The CS681 provides 8 recording channels to process up to 8 search coils. A high performance digital signal processor and a high speed field programmable gate array are used to detect the angular orientations of the search coils in real-time and to control the system. The use of the CS681 is very user friendly thanks to the automatic tuning of the gain- and offset settings. All settings may also be controlled manually over the touch screen or over the USB interface with the included application software. dimensional (horizontal, vertical, torsional) eye and head movements in neurophysiological, ophthalmological, psychological, psychiatric and visual studies. The CS681 is intended for research use only and has not been reviewed, certified, or approved for clinical purposes. All use of the system must be in compliance with appropriate procedures. The picture shows a motorized multi-axes turntable, equipped with our search coil system (by courtesy of Prof. D. Straumann, Neurology Department of the University Hospital Zurich). The long-term goal of this research is to better understand central and peripheral diseases of the ocular motor system in humans and to assess potential treatments. See also the list of references with some publications, in which the method includes a Primelec eye tracking system. The CS681 provides gain-, offset- and phase correction for the respective X-, Y- and Z-signals per channel. Internal lowpass filters with user selectable characteristics may be applied to each channel separately. The user selectable search coil polarity reversing per channel is useful to reverse the polarity without the need to change the physical connection polarity of the respective search coil. Similarly, the user selectable magnetic field polarity reversing per axis may be useful to meet a specific coordinate system without rewiring the system. Even though the extraordinary versatility of the CS681, the operation is very user friendly. The system provides automatic tuning of all gain-, offset- and phasing settings, which eliminates the need for manual adjustments. In addition, the CS681 comes with non-volatile memory for up to ten user specific system setups to ensure quick and effortless system reconfiguration. The user may control all settings manually over the touch screen of the display. A menu system allows the quick and straightforward system configuration. In addition, the system is completely controllable over the USB interface. The CS681 comes with an application software, which may be used to control the system over the USB interface. The CS681 provides analog and digital output data, i.e. 24 analog outputs and a USB interface. The analog outputs of the CS681 may be used in conjunction with an external data acquisition system, e.g. an analog data acquisition board for a PC. The user may select the format of the analog output data: linear angular data (horizontal and vertical orientation of the search coils, i.e. no additional trigonometric calculations required) or detected signals X, Y and Z (raw data). The voltage swing of the analog outputs is user selectable to match the output voltage range to the input voltage range of the external data acquisition system. 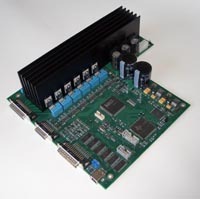 The USB interface of the CS681 eliminates the need for an external analog data acquisition system, which improves system performance and saves costs. The USB interface continuously transmits data packets consisting of all output data (linear angular data and raw data, 21 bit resolution), a time stamp and a sequential packet number. The output data rate of the CS681 depends on the number of processed channels. The user may select the processing of two, four or eight channels, depending on the number of search coils used for the experiment. If two channels are processed, the CS681 provides a very high-speed output data rate of 8000 readings per second. Processing all eight channels still ensures a high speed output data rate of 2000 readings per second. Included with the CS681 is an application software (MS Windows). The software may be used to control the system configuration, to analyze and capture the digital output data and to upgrade the system firmware over the USB interface. Also included is an ActiveX control for MS Windows. The ActiveX control allows a user application software, e.g. a LabVIEW VI, the straightforward communication with the CS681 over the USB interface. The ActiveX control comes with detailed documentation (help file) and example applications (Visual Basic source code and LabVIEW VI). The coil frame consists of three field coils (X-, Y- and Z-coil), composed of aluminium bars with a cross section of 8 mm. Thus, the restriction of the visual field is minimal. 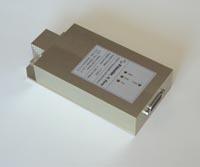 An external Matching-Box contains the required capacitor networks for resonance tuning. The entire coil frame may be dismounted if required, e.g. for integration into a user specific setup. 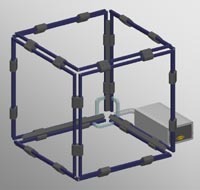 Primelec offers coil frames in various colors, arranged as a cube with an edge length in the range from 250 mm to 700mm. Within this range, the exact dimensions are freely customizable. The option "Removable Bars" makes it possible to open the coil frame by effortless removing of two bars. This unique feature may be essential to insert large objects into the coil frame, e.g. a primate chair. The removable bars are plugged into the coil frame such that both electrical connection and mechanical fixation is ensured and no tools are required to open and close the coil frame. The CS681 is capable to process up to eight search coils, which is sufficient for almost any application. For example, simultaneous recording of horizontal, vertical and torsional binocular eye plus head movements requires six recording channels. Various search coils are applicable in terms of dimension, geometry, number of turns and material. Of course scleral search coils are suitable. Torsional recordings require a two-in-one search coil (frontal and sagittal plane), i.e. two recording channels are required. The CS681 is compatible with search coils of third-party suppliers. Our partner CHRONOS VISION manufactures and distributes 2D (direction) and 3D (torsion) scleral search coils which are perfectly suited for the CS681. CHRONOS VISION search coils have been tested successfully in a number of research laboratories in Europe and in the USA. On request, CHRONOS VISION manufactures customized scleral search coils e.g. with embedded black markers for simultaneous measurements of three-dimensional eye movements using videooculography. 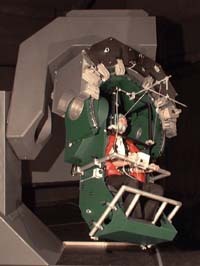 The magnetic field search coil technique introduced by Robinson  has become the most commonly used method for quantitative studies of eye and head movements in man and in experimental animals. A coil frame is used to generate an AC magnetic field. The coil frame consists of two or three field coils arranged in space quadrature, which are driven by field signals of different frequencies. The resulting magnetic field induces a voltage in a search coil placed in the coil frame. The spectral components of the field frequencies in the search coil signal are proportional to the sine of the horizontal and vertical angular displacements of the search coil relative to the coil frame. Traditional search coil systems usually use analog electronics to demodulate the search coil signal with respect to the magnetic field directions. Additional analog to digital converters and a computer are used to capture the demodulated search coil signal and to calculate the angular orientation of the search coil. This approach requires fairly complex system adjustments by the user and may result in poor system performance with noise-, drift- and linearity issues. The CS681 uses another approach to demodulate the search coil signal. The spectral components of the field frequencies are obtained by calculating the FFT (Fast Fourier Transformation) of the digitized search coil signal in real-time. This approach (introduced by Primelec in 1999) provides remarkable advantages compared to traditional search coil systems. Very high system performance is achieved and almost no system adjustments are required by the user. Three digitally synthesized sine wave signals of different frequencies are generated by the main unit. These field signals are applied to the coil frame to generate the AC magnetic field, which induces a voltage in the search coil(s). The CS681 comes with an external preamplifier to avoid routing the susceptible search coil signals over a long distance. The preamplifier mainly consists of eight amplifiers and two analog multiplexers. The amplifiers have ultra low noise input stages and digitally programmable gain. Their inputs are transformer-coupled for galvanic isolation between the search coils and the amplifiers. The outputs of the eight amplifiers are time-multiplexed by two 4:1 analog multiplexers. The output signals of the multiplexers are buffered and differentially transmitted to the main unit, which also controls the timing of the multiplexers. The main unit contains two analog to digital converters which digitize the output signals of the multiplexers simultaneously and synchronized to the timing of the field signals. The use of a DSP (digital signal processor) and a FPGA (field programmable gate array) makes it possible to compute the FFT and the subsequent trigonometric calculations in real-time. The complete data processing for two search coils takes less than 125 us, resulting in a high-speed output data rate of up to 8000 readings per second. The computed output data is available over the USB interface and as analog signals over the integrated digital to analog converters.